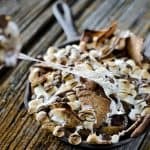 These S’mores Nachos are an incredibly easy recipe with only 4 simple ingredients and they are ready in just 10 minutes! We are continuing on with S’mores week here at Krafted Koch and I couldn’t be more excited to share all of these yummy S’mores recipes with you. In case you missed it, on Monday I shared one of my favorite cookie recipes, a S’mores Thumbprint along with 25 other wonderful S’mores recipes from fellow bloggers. Stay tuned Friday for even more! These S’mores Nachos are so incredibly simple with only 4 ingredients and they are ready in only 10 minutes! Not only are they simple to make, but more importantly, they are absolutely delicious! Instead of just throwing some graham crackers in the skillet, I used Stacy’s Cinnamon Sugar Pita Chips, my favorite go-to for any dessert nacho. They hold up to anything you throw on them and add an extra element of flavor with their cinnamon and sugar coating. 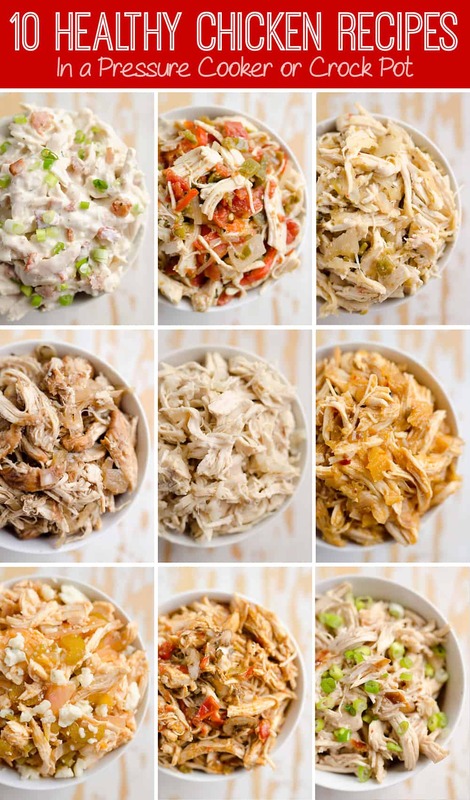 And hey, they are pita chips, so that makes this whole recipe healthy right! …no??? Oh well, either way, they are worth the calories and such a fun way to enjoy S’mores in the comfort of your home any time of the year. Be sure to check out lots of other great S’mores recipes below from fellow bloggers! 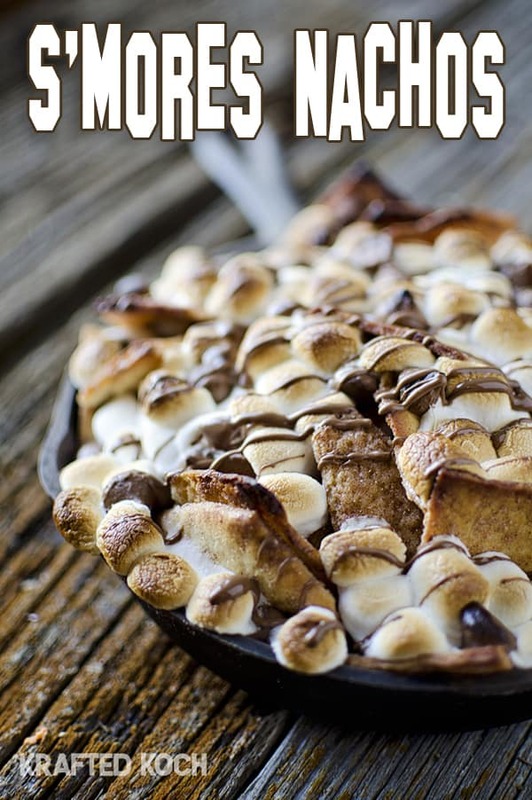 S'mores made in your oven in 10 minutes with cinnamon sugar pita chips for a fantastic treat you can enjoy year round! Fill a 10" oven safe skillet or pan with the bag of pita chips. Top with 1 c. chocolate chips then marshmallows. Place in oven and bake at 350° for 6-8 minutes or until marshmallows are golden. Meanwhile, place 1/4 c. chocolate chips in microwave safe bowl with the oil (I used coconut) and microwave in 15 second increments until completely melted. Be sure to stir after each increment, so to be sure not to burn the chocolate. Drizzle the melted chocolate over the nachos and enjoy your indoor 10 minute s'mores! Holy moly! I love this idea! 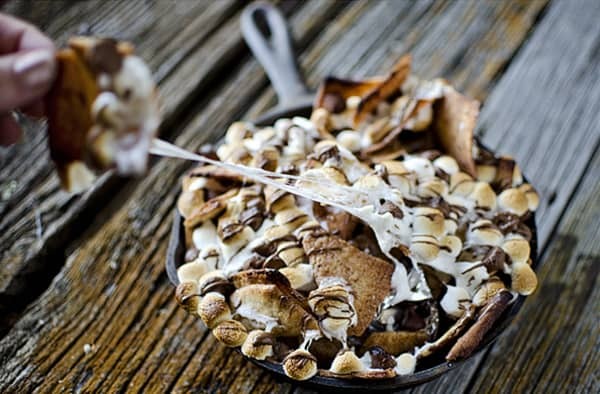 Stacey’s cinnamon sugar pita chips are amazing all on their own and then you add all this fabulous s’mores goodness! Pinned! Thanks Lindsey, those pita chips ARE amazing! I can have this in 10 minutes! Oh yes! I too, am a sucker for gooey marshmallow! OMG – that ooey gooey picture with the marshmallow being pulled from the dish on the pita chip?!! I think I’ve died and gone to s’mores heaven! Love this recipe so much! Pinned, obviously! Oh My! What a fantastic dessert. I need this in my life right now. Can someone say hello cheat day!!!! Love the gooey pull pic! So quick and easy. Looks great. Just pinned it. I am thinking of taking this to a party. Do you think it would be good after it cooled down, or is it better hot? Thanks Kevin! I think it should be fine at room temp, because the marshmallows will remain gooey, just the chocolate will harden. this was a big hit at my office today. Everyone raved how good it was. Good to hear everyone enjoyed it Jessica! What kind of chocolate chips would you use?? Personally I like dark chocolate chips, but semi-sweet would also work! 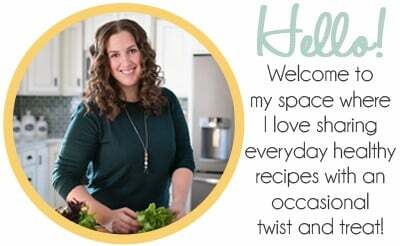 Hi Shari, I’m so sorry you encountered a problem trying to pin from my site. I have never blocked anyone from pinning from my site and I don’t know that it is even possible. If you could be so kind as to send me a screenshot of what you are experiencing I would greatly appreciate it so I can look into the technical issue you are experiencing. Thank you!